Half-trailed machine with three-points hitching and compact articulated easy to handle coupling, special for vineyard. 1.050 mm wide at maximum for machines of 800 and 1.000 l.
Crops’ frames from 1,8 to 3 m. Vineyard height up until 2,5 m.
Focused treatments on 2 or 3 rows simultaneously. Applications from 150 l/ha. with minimal drift. March speed up until 7 km/h. Machine with low consumption impeller. Highest required power (air unit + pump) 40 HP. Kit with opening of telescopic arm and folding boom end. 3 complete rows’ treatment.The 2 external sides are sprayed with cannons. Air distribution and liquid flow 100% uniform per lane, adapted to the leaf formation of the crop.The kit consist of 6 fan spouts and 4 cannons, all of them steerable and adaptable to the specifications of the crop.Optional hydraulic lift with a travel distance of 500 mm.Easy to handle with obstacles and lanes change.Option of steerable cannons by an electrical piston. Kit with opening of telescopic arm and folding boom end. 2 complete rows’ treatment. Distribution of air and uniform liquid flow, adapted to the leaf formation of the crop.100% focused treatment without drift. 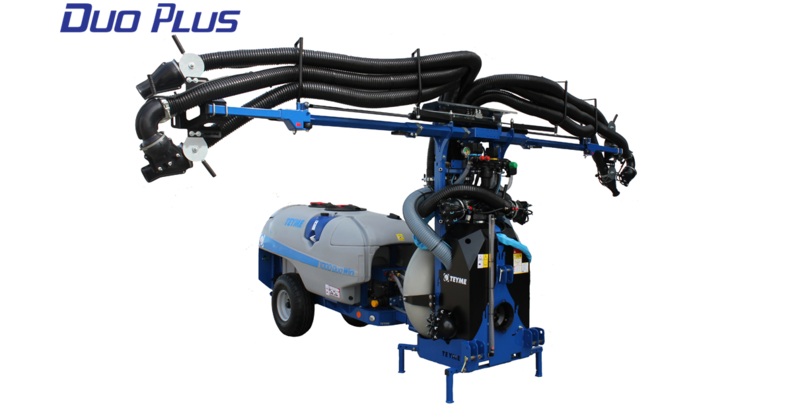 X-L treatment technology.The kit consists of 8 steerable fan spouts which are adaptable to the specifications of the crop.Optional hydraulic lift with a travel distance of 500 mm.Easy to handle with obstacles and lanes change. *Both kits allow whether a pneumatic system with a circuit of liquid at low pressure (from 2 to 6 bar) and high air speed in hands (100 m/s) or a hydropneumatic conventional system with a circuit of liquid at high pressure (from 8 to 14 bar) and medium air speed in the hands’ outlets (50-60 m/s). Top performing air unit with polyethylene blower housing and 16.300 m3/h as highest flow rate. Gear box 1 speed and neutral point. On option: suction protector against dirt. Half-trailed compact frame with 3-points hitching for tractors classified 1 and 2 according to rules UNE6 8006-1. Support feet in lift-mounted half-frame and jackwheel in trailed half-frame. Articulated tow bar between the lift-mounted frame and the towed tank with 4 height-positions.Protecting plates for the pump group and gear box. By means of 2 Euromix (specific double circuit with high pressure in pneumatic machines which spray at low pressure) which attain a constant and homogeneous mixing.Full sweeping of the bottom. Pneumatic system: 3 or 4 jets per hand and 1 per cannon with anti-drip and individual closing tap. Liters/minute ratio proportional to the covered leaf mass. Conventional hydropneumatic system: individual or double nozzle-holder per hand with anti-drip and individual closing tap. ATR 80º hollow cone nozzles. Tanks in top quality polyethylene and with uniform thickness. Main tank with 2 flip-top lids, rinsing circuit tank (10%) and sanitary water tank 18l. Capacities: 800, 1.000, 2.000 l.
Design according to ISO 9367 and 13400 rules. Against whirlpool. Full emptying even in 10% steep plots. 2 transparent level gauges: 1 on front with vision from the cabin + 1 on side for filling in. Fixed axles: Center wheel to center wheel 850 mm in 800 and 1.000 l, 1.200 mm in 2.000 l.